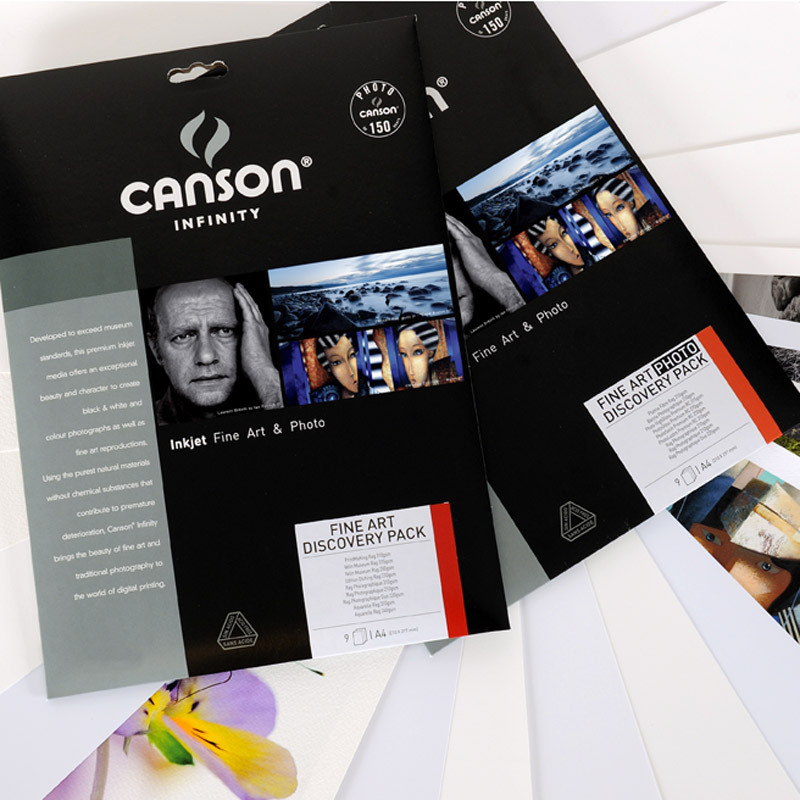 The handy Discovery Pack contains samples from the Canson® Infinity range. An ideal way to discover and choose the type of edium best suited to the needs of artists or professional photographers. - Platine Fibre Rag 310gsm - 100% Rag, ultra smooth glossy, pure white, without OBAs. - Baryta Prestige 340 gsm - It is a smooth Baryta Gloss paper which evokes the look and aesthetic feel of traditional darkroom papers (2017 TIPA Award). - Photo HighGloss Premium RC 315gsm - alpha cellulose resin coated, ultra white and ultra smooth with the highest gloss level of the RC paper market. - PhotoGloss Premium RC 270gsm - alpha cellulose resin coated, glossy, ultra white. - PhotoSatin Premium RC 270gsm - Resin coated Satin, Extra white. - Rag Photographique 310gsm - 100% rag – ultra smooth, ultra white paper, without OBAs. - Rag Photographique 210gsm - 100% rag – ultra smooth, ultra white paper, without OBAs. - Rag Photographique 310gsm and 210gsm - 100% rag – ultra smooth, ultra white paper, without OBAs. - Velin Museum Rag 250gsm - 100% rag, Mould-Made, smooth, pure white paper, without OBAs. - Aquarelle Rag 240gsm - 100% rag, Mould-Made, smooth, pure white paper, without OBAs. Additional comments You can test the various possibilities with our Discovery Packs. Canson® Infinity Archival Photo Storage boxes are specifically designed for the archiving and conservation of your photographs and documents.